One of the great things about the XW synths is that there are a variety of different ways to work. If you’re not careful however you can make a change that could delete something that you’ve been working on. So here is what I do, when I sit down on the XW to make some new music. So assuming you’ve put down a basic groove, now you’re probably (if you haven’t started already) started playing something over the top. Before you do anything else STOP! Save your sequence. Up to the point when you saved, your sequence was living in a temporary buffer. What can inevitably happen is that find a sound that you like, maybe an arpeggio pattern that goes with you sequence. The only way to save these two things together is in a Performance. So if you go to a Performance and accidentally change to a different performance you are likely calling up a different step sequence that is linked to that performance. So if your temporary sequence was not saved, it is now gone. Take the time, save and name your work. Now back to making music! Casio XW Synths and the big blue LED. So it’s hard to miss, the giant blue LED on the left hand side of the XW-P1 and XW-G1. So besides looking very cool on stage or in the studio, what is it for? Simply put the LED indicates the function of the sliders below. In the XW-P1 the LED will light up depending on which of the three specialty sound engines you’re using – Solo Synth, Hex Layers or Drawbar organ. In each of those modes the sliders function almost the same way. In the case of the Solo Synth or Hex Layers, the first six sliders provide volume control of the oscillator or layers, the 7th slider provides total volume control and the 8th and 9th control effects. In Drawbar organ mode, all 9 sliders are used for the organ. The buttons to the left of the LED also provide an additional way to switch between categories of sounds. If you press the STEP SEQUENCER button, the big LED will be off but now the sliders will now provide control over parts in the Step Sequence (more on this next week). 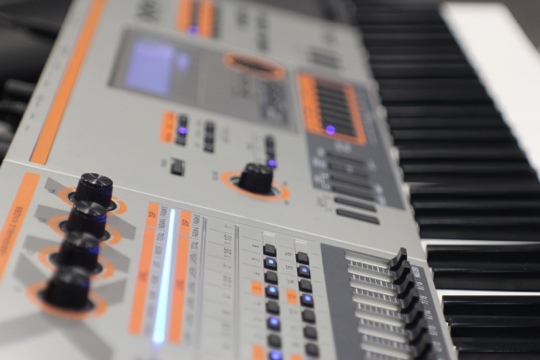 In the XW-G1 the big LED indicates which part of the solo synth can be manipulated in real-time. Since the G1 doesn’t have HexLayers or Drawbar organs you get additional control over the Solo Synth.